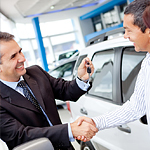 Trade-ins work if you have been paying on a car note and have some equity that you can use to get into a new vehicle. While the vehicle is typically less than your other car, it's a great way to get out of debt and lower your payments or eliminate them completely. You can also see your options when you come visit Perkins Motor Plex. You can see all of the cars available for a trade-in or see what's available for refinancing. Your best option is to get into a car that matches your financial situation.